12 months & up. 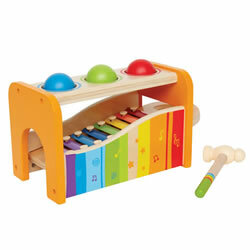 Tap the balls on top with the toy hammer and listen to the melodies as they roll down or pull the xylophone out and tap directly on the keys to make your own melody. 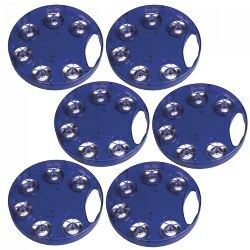 Promotes fine motor skills and problem solving skills. Made of wood, water-based paint, PA, and metal. Exposes little ones to music for the first time. Measures 13 1/2"H x 15" W x 24"L.
3 years & up. Celebrate movement through dance and simple aerobic exercises. This CD set represents a cross section of musical styles from slower tempos to rock-n-roll and everyone's favorite The Hokey Pokey. 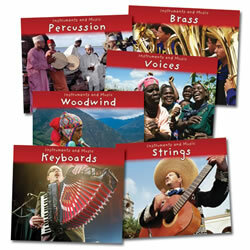 Added exercise CD's from Greg and Steve will make this set a classroom favorite! 12 months & up. 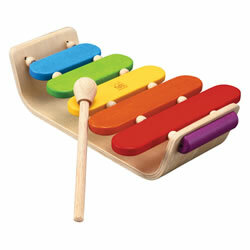 This xylophone will help develop hand-eye coordination and reinforce children's natural sense of harmony and rhythm. The brightly colored bars have rounded corners for safety and made of chemical free, kiln-dried recycled rubber wood. Measures 2 3/4"H x 7"W x 11"L.
4 years & up. With the Adventures in Sound booklet in hand, children will begin to explore and learn how to play small percussion instruments and develop a basic understanding about music. 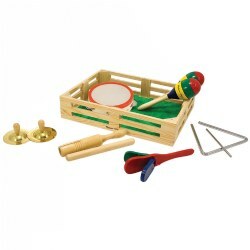 Includes: drum, glockenspiel, triangle, tone block, wrist bells, pair of sand blocks, pair of rhythm sticks, pair of maracas, cow bell, guiro, tambourine, Adventure in Sound booklet and storage container. Due to availability, some instruments may be substituted. 6 months & up. A simple turn of the Baby Rainbomaker creates a combination of sound and color that will captivate inquisitive young ones. 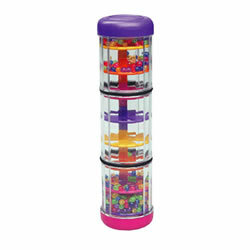 Watch and listen as a rainbow of colored beads cascade through the tube recreating the soft sound of gently falling rain. Colors will vary. 6 - 36 months. Four easy-to-press keys are a great way to introduce little ones to the piano. Smooth rounded corners for added protection. Little ones will learn cause and effect through music. Also encourages rhythm and timing development. 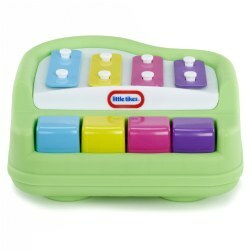 This baby piano makes a great first musical toy for babies! Measures 8"L x 8 1/4"W x 4 1/4"H.
3 years & up. 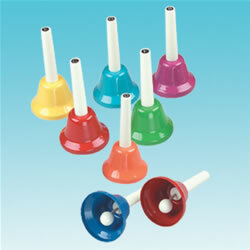 Introduce tonality and the one-octave scale with these colorful hand bells. 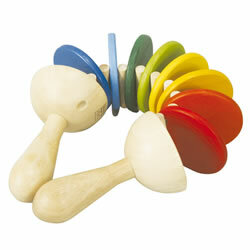 Promote cooperation by having each child play one bell, creating their own melody. 18 months & up. This instrument makes a click-click sound that changes with play. It can start as a gentle ripple to a clattering crescendo that brings smiles across toddler's faces. 3 years & up. A multicultural musical journey begins with easy-to play rhythm instruments -- handmade by artisans in Africa, South America, and the South Pacific. The instruments were chosen for their distinct sound that help create interesting music and encourage listening and playing together. Includes bottle cap shaker, caxixi shaker, fire-burned gourd drum and gourd shaker, paddle drum, egg shaker, bamboo scraper, pair of wood claves, frog rasp and sturdy canvas bag. Due to availability, instruments may vary. 2 years & up. Set of 3 wooden castanets, each with a different sound. Features numbers 1, 2, 3 on one side and A, B, C on the other. 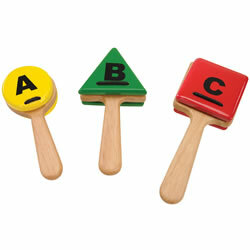 Use for color, number, and letter recognition; beginning pattern making; and hearing high and low sound changes. Activity guide included. 2 years & up. This tambourine has a unique design with the jingles on the inside for added safety. 7" diameter. 6 months & up. 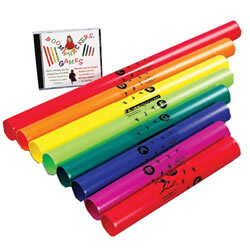 A simple turn of the Rainbo creates a combination of sound and color that will captivate inquisitive young minds. 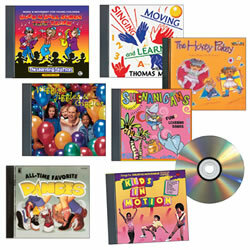 A CD set with over 3 hours of traditional and original children's songs. 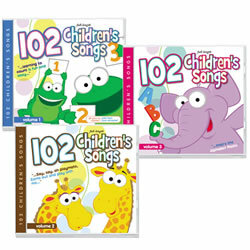 The 3 CD set includes songs that teach colors, shapes, letters, numbers, manners and more. Some of the favorites include: The ABC Song, B-I-N-G-O, Eensy Weensy Spider and Hickory Dickory Dock. Also includes marches, songs about feelings and safety. 3 years & up. 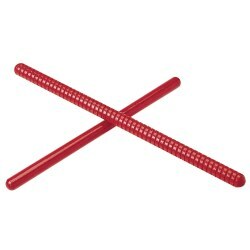 Use these rhythm sticks to enhance your musical fun. 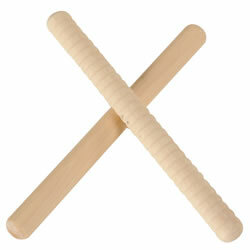 Set of 2 sticks, 10" x 1/2" diameter. Made in the USA. 3 years & up. 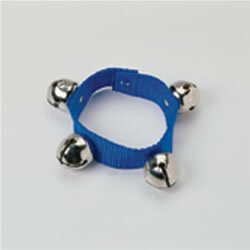 Wrap a wrist bell to a wrist or ankle and move around to put the jingles to motion. Four bells are securely attached to assorted colors of nylon strap with a Velcro® closure. 2 years & up. Sized right for children, these natural American hickory wooden feature one smooth and one ridged stick. 8" long. 3 years & up. 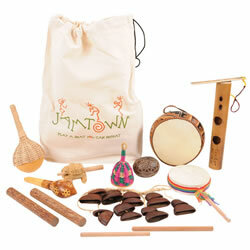 Little musicians can form a traveling band with this compact wooden music set. 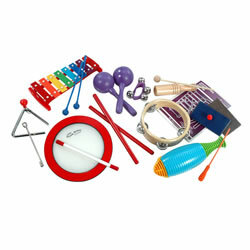 Featuring fun musical pieces, this quality kit is the perfect way to introduce youngsters to musical play. Pieces include a colorfully designed pair of maracas, hand cymbals, tambourine, triangle and two other wooden noisemakers. Every piece fits conveniently into a sturdy wooden storage crate. Measures 3"H x 11"W x 14.7"L packaged. 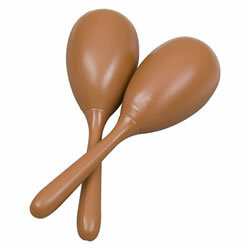 Shake this set of maracas of extra musical fun. 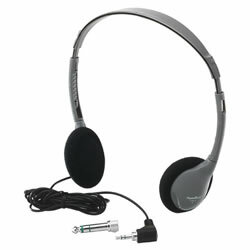 This lightweight stereo/mono headphone features high quality sound, 1/8" plug, 1/4" adapter, 9' cord and heavy duty, write-on resealable bag for lice prevention. 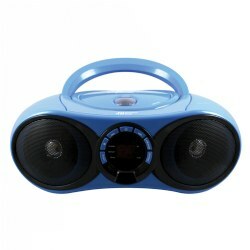 The soft, soothing music is especially selected to enrich development and help young minds grow! 4 CD Set. 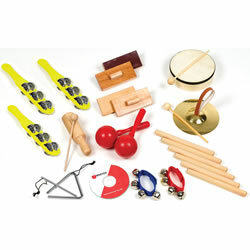 Includes: 3- 8" rhythm sticks, 1 pair of maracas,1 crow sounder, 1 pair of sand blocks, 1 pair of tap-tap blocks, 1 frame drum, 1 cymbal, 1 triangle, 2 wrist bells, 3 jingle sticks and instructional DVD.Please note: If an instrument becomes unavailable, a suitable substitute may be found as a replacement to complete the set.